24th Annual SCBWI Eastern PA Poconos Retreat! 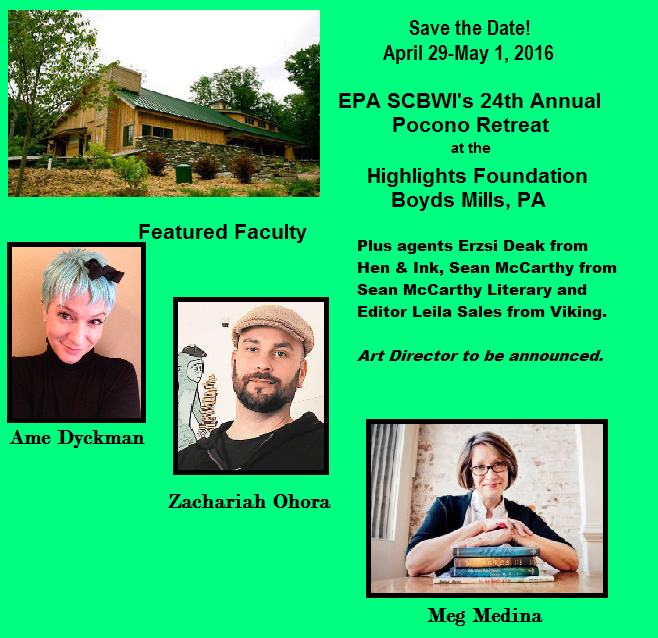 SCBWI Eastern PA will hold our 24rd Annual Pocono Mountain Retreat at the Barn in Boyd's Mills on April 29 – May 1, 2016. Join a stellar cast of children's book authors and illustrators at this year's retreat at the beautiful, unique facility, The Barn, Highlights Foundation, Honesdale, PA.
Network with peers, authors, illustrators, agents and editors. Attend Workshops, have your work professionally critiqued, and even find a little creative time if you'd like! If you’re an SCBWI member, make sure you're logged in to the website so you can see discounted member pricing. Our full conference schedule runs from Friday, April 29, 3:00 PM (registration and Critique-a-thon beginning at 11:30 am), through Sunday, May 1st, at 1:30 PM and the cost is $275 for SCBWI members ($325 for non-members). Sorry – no refunds after 3/27/15. SATURDAY ONLY OPTION – Life is busy. We understand. If you can't get away for a full weekend, you don't have to miss the entire event! You can register for our Saturday-Only option and still hear fantastic speakers, hone your craft in your choice of 2 Workshops (choose 1 from each selection A B or C), and opt to add in a professional critique too! Cost for Saturday-Only Registration is $215 for SCBWI members ($235 for non-members). Sorry – no refunds. Meals and Lodging are not included in Registration fees. Those opting for Saturday Only Registration will still need to make meal arrangements with Jo Lloyd at the Highlights Foundation. Lodging is available on site at the Highlights Foundation or at the nearby Central House. Rooms for two nights (Friday and Saturday) and onsite meals from Friday–Sunday lunch are $293 for a single and $218 for a double, triple or quad. Price includes room and meals for the weekend. Single rooms are limited and available on a first come, first serve basis. For reservations, please contact Jo Lloyd at the Highlights Foundation at jo.lloyd@highlightsfoundation.org or call 1(877) 512-8365 or (570) 251-4557. A free shuttle will be provided to and from the Central House. If you are choosing the Saturday-Only option, accommodations for meals can be made by contacting jo.lloyd@highlightsfoundation.org or call 1(877) 512-8365 or (570) 251-4557. Cost is $75. Single night room accommodations can also be arranged if needed. Cost is $88. Please contact jo.lloyd@highlightsfoundation.org or call 1(877) 512-8365 or (570) 251-4557. If you will not be staying onsite, please contact Jo Lloyd (above) to make necessary meal arrangements. *Please inform of any dietary restrictions when making lodging arrangements* MEALS: Are included in lodging costs from the Highlights Foundation but are not included in the registration costs. If you will not be staying onsite, please contact Jo Lloyd to make meal arrangements. If you have any special dietary preferences or requirements, please inform the Highlights Foundation when making lodging reservations. Please Note: The dates of this year's reatreat coincide with the end of Passover. If you will be observing, the Highlights Foundation can make certain dietary arrangements to assist you at no additional cost to you. Please speak directly with Jo Lloyd to ensure the arrangements available will meet you needs, jo.lloyd@highlightsfoundation.org or call 1(877) 512-8365 or (570) 251-4557. Scholarships: One or two full scholarships are available to SCBWI EPA members who demostrate exceptional promise as a writer or illustrator, and who could not otherwise afford to attend the retreat. Scholarships will cover the registration fee and full accommodations for the weekend. Recipients are responsible for their own transportation and will be asked to volunteer and assist as needed . Please do not apply if you can truly afford to attend. Those who have received SCBWI EPA scholarships previously may not apply. 3. Authors : Up to ten (10) pages of a manuscript (12 pt., double-spaced, saved as a .pdf, .doc or .docx). It may be a work in progress, but must not be published or under contract. 5. Winner will be notified by email. The Selection Committee reserves the right to not award a scholarship if applicants do not meet necessary criteria. Deadline: Email your submission to easternpascbwi@yahoo.com, subject line CAT Submission no later than April 6. Include your name, email and the genre at the top. No cover letter. For picture books: Send the entire manuscript. Format: Double-space, one-inch margins, page numbers, and use .doc or .docx format. Illustrator Portfolio Peer-to-Peer Critique Session: (Free with registration) Sign up for this invaluable peer review of your portfolio by contacting Illustrator Coordinator Adrienne Wright Adiillustrate@gmail.com by April 6. ARTWORK/PORTFOLIO CRITIQUES: (at additional cost of $45) Register and add on this option. Bring your art to the conference. Please do not send your work in advance. Submit your payment of $45/critique with your conference registration online or by mail no later than March 31, 2016. MANUSCRIPT CRITIQUES: (at additional cost of $45) Register and add in this option. Email up to 10 pages of one manuscript, plus a one-page synopsis to easternpascbwi@yahoo.com using Subject Line “MANUSCRIPT CRITIQUE POCONOS 2016”. For picture books: Send one entire manuscript. Please follow standard formatting guidelines, double-spaced, 12 point font. Manuscripts must be received by March 11, 2016. No submissions will be accepted after this deadline and revisions will not be accepted either. Attendees may select one paid manuscript critiques. If additional spots are available, additional opportunities will be opened at a later date. Note: Although a picture book may have fewer than ten pages, each manuscript counts as a separate submission. You will receive an email confirmation of receipt of your manuscript. If you do not receive confirmation by email, please let us know as we may not have received your submission. Upon arrival, you will be informed of the time and faculty critiquer assigned to you. We do NOT honor requests for specific critiquers but we make every effort possible to match you with faculty best able to review your work. Submit your payment of $45/critique with your conference registration online or by mail no later than March 11, 2016. IMPORTANT: Critiques often overlap workshops, and signing up for a critique may mean you'll miss part of a workshop. First Pages/First Looks: (free with registration) We’ve planned two sessions where a panel from the faculty will give feedback from selected First Pages/First Looks. To be considered, please use Subject Line “Pocono First Page/First Looks” and submit the first page of your manuscript, double-spaced, 12-pt. type, one page only (starting at the top of page) or up to 3 related illustrations, saved as jpgs or PDFs (in one email) to easternpascbwi@yahoo.com. Please include the genre and word count in the upper right hand corner of the page. Names should not be visible anywhere on the page. We regret we may not be able to use all submissions due to time constraints but we will try to accommodate a variety of genres. First Pages/First Looks submission deadline is April 15, 2016. PORTFOLIO/ART EXHIBIT: Illustrators, table space can be provided for you to exhibit your portfolio. Be sure to have any display props you may need (such as a tabletop easel). Original art is not permitted, as SCBWI cannot be responsible for any loss or damage. Please contact Adrienne Wright at Adiillustrate@gmail.com for more information. BOOK SALES: Speakers, workshop leaders,and critiquers, and attending conference will sell their books through our on-site independent bookseller The Book Connection. The conference bookstore will be open Fri., Sat., & Sunday. PAL SCBWI members who are paid attendees of this event may also sell their books at the conference, but must provide copies for sale at an individual table, not through the bookseller. Only PAL (Published and Listed) members are eligible to sell their books. Please visit https://www.scbwi.org/Pages.aspx/SCBWI-Market-Surveys to ensure your publisher is PAL-approved. If so, register for the event, then email easternpascbwi@yahoo.com to arrange table space.